The homeowners wanted to create a space purely for entertaining and hosting family gatherings that highlighted the picturesque view of their St. Francis Xavier acreage. 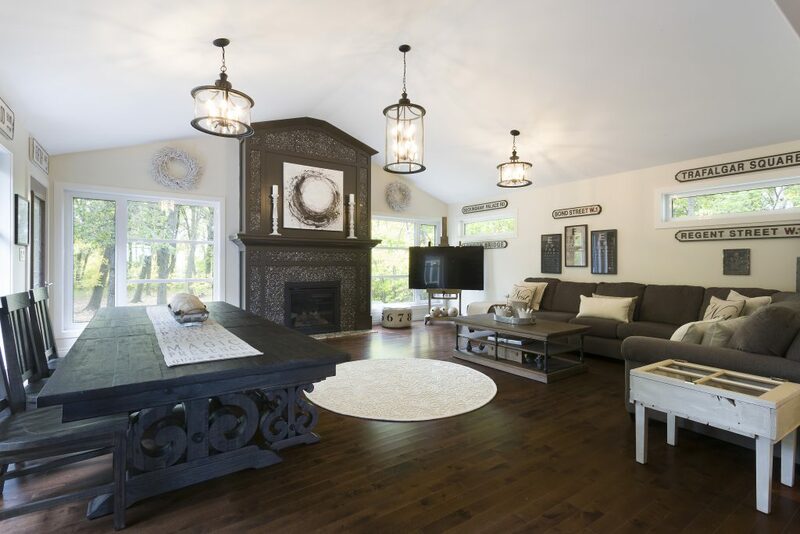 Vaulted ceilings, large windows, a composite deck, and custom moulding are only a few details that accentuate this unique addition. The choice of flooring allowed for a seamless transition from the adjacent kitchen. A fireplace was a must have and serves as a focal point that can be viewed from the front entrance. Hand painted tin tiles and custom trims are only a few items that make this space feel decadent and welcoming. This growing family loved their central location, but needed more space. They wanted to keep the added space simple, functional, and cost effective. 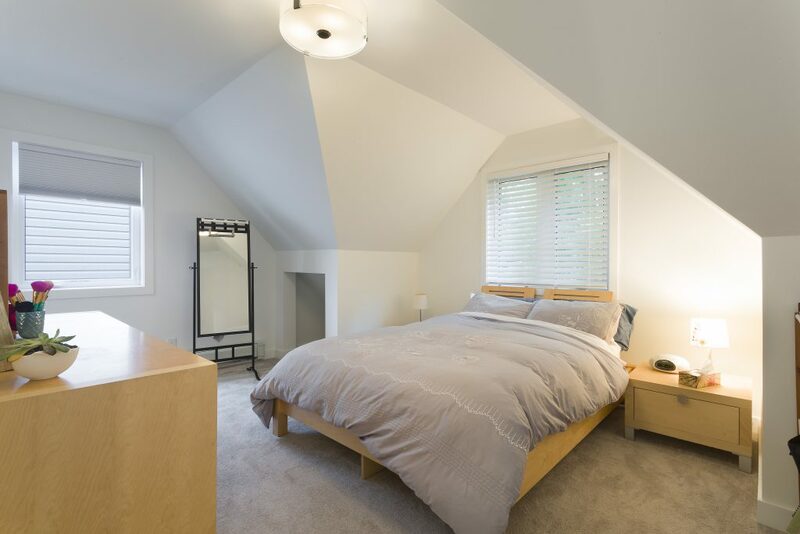 To gain maximum square footage at the most reasonable cost, we elected to add a second story consisting of 3 bedrooms, 1 bathroom, storage space, and a small “study nook”. This kitchen addition was completed in a modern farmhouse style combining old wood with clean white lines. 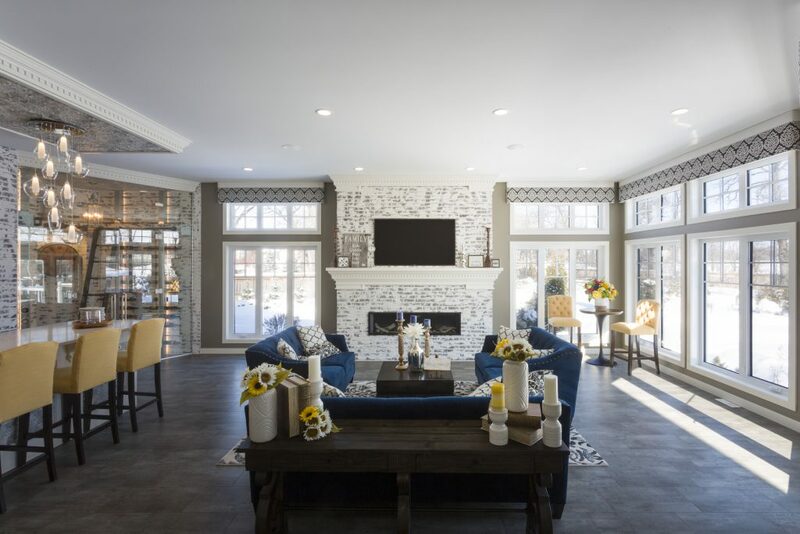 Our clients wanted to expand their living space on the main floor. The foyer features striking retro flooring and functional custom lockers which seamlessly extend into the kitchen featuring white shaker style cabinets, quartz countertops, maple hardwoods and farmhouse sink as well as a gorgeous custom island with a re-claimed T&G chevron front and a butcher block counter. The renovation then extends into the stunning dining area featuring a custom live-edge fireplace mantle with stack stone facing. The 2 storey home in Wildwood Park needed some help. The kitchen and sunroom additions were falling apart. The clients wanted indoor parking & storage, additional family and entertaining space and a larger master bedroom. 2 additions were built, one with a main floor sunroom and master bedroom above, the 2nd a kitchen, mudroom , rear entry & attached double garage. 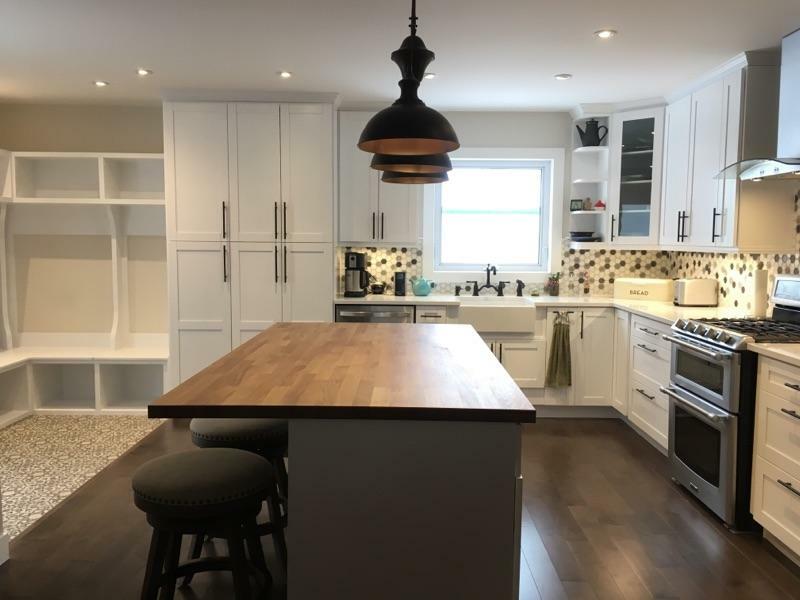 The new kitchen is open to the entire lving space of the main floor, and the wndows to the south and west flood light into the entire main floor. The objective was to create an entertaining space off of the current living room that felt seamless and fit with the ambiance of the home. The existing fireplace wall was removed and became the new 12 foot wide entrance into the 800 sq foot addition. The 11 foot high ceilings give the space amazing views into the beautiful landscaped yard. A custom bar with a quartz surface, glassed in wine room with custom fabricated backlit wine racking and the impressive fireplace with German Schmear brick detail are only a few elements that make this addition stunning. 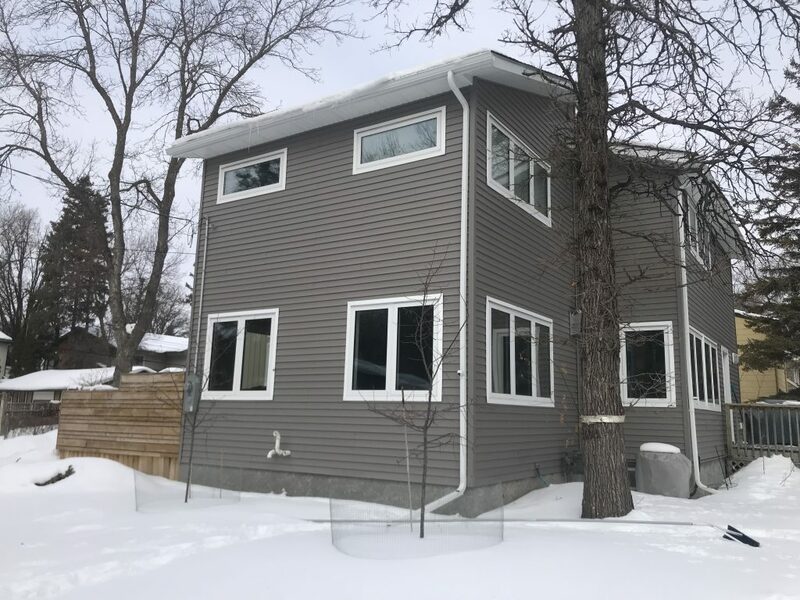 Armstrong’s Point is a beautiful neighbourhood located in Winnipeg’s west end in a bend of the Assiniboine River and is planned to become Winnipeg’s first Heritage Conservation District. 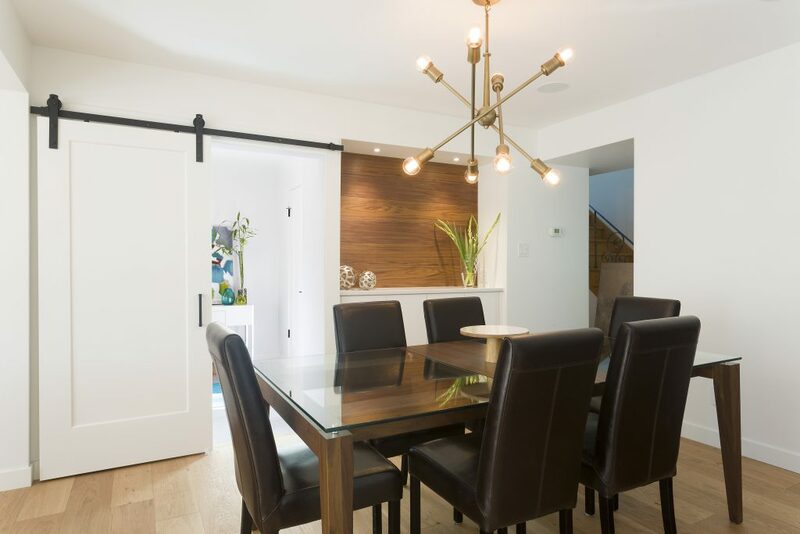 Homes here are full of character; ensuring that renovations respect the history and character of this neighbourhood is critical to any project undertaken. This home addition was designed and built with aging-in-place in mind and blended in perfectly with the existing home. 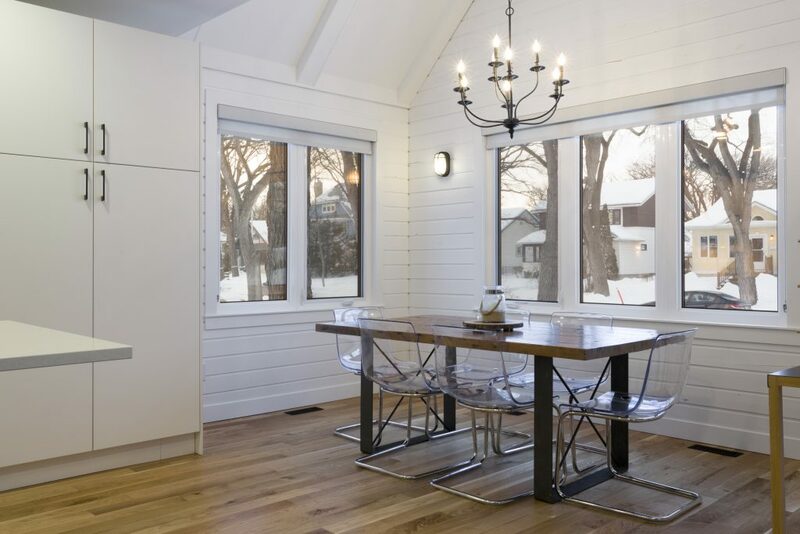 Included is a large bedroom with views of the river, ensuite bathroom and second full bathroom with zero-clearance showers, mudroom, four-car attached garage — all wrapping around a hidden courtyard.